Guys, you really shouldn’t have. Actually, I think there might be some other event going on as well. In fact, I was excited to hear that Papershop Village was actually planning a street party to celebrate it for today. The thing about Papershop Village is that it only really has one street, and that’s Big A Road. Sadly, they didn’t manage to close it for the event. ‘I’d have paid money to see that,’ I remarked when I heard. ‘So would we,’ said the other resident in the shop rather sadly. This morning, bunting or no bunting, the village was its usual closed-down self, with the usual lorries thundering through it. The ‘street’ party is this evening, in the village hall, safely away from causing any traffic chaos. 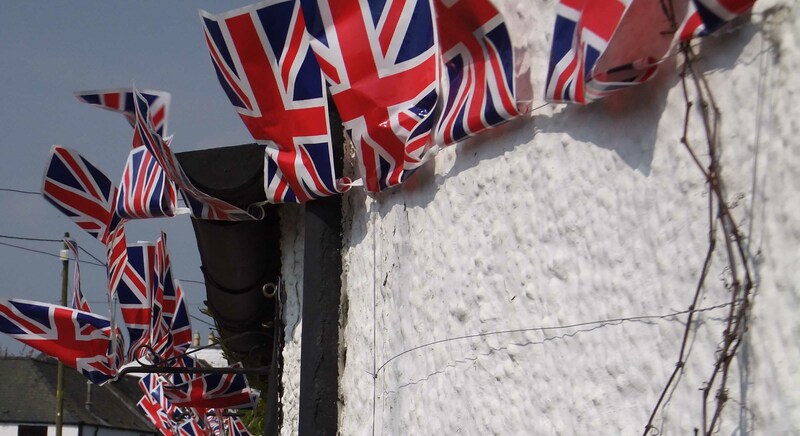 And Nearest Village (not a scrap of bunting in sight) has decided somewhat pointedly to hold its celebration (the annual soup and sweet lunch) tomorrow rather than today. How’s royal wedding fever down your way? I don’t know why I bother trying to grow carrots, frankly. For a start pretty much everything you read about growing carrots emphasises how difficult and complicated it is due to the dastardly carrotfly, a creature which seems to know no bounds in its cunning and determination to wipe out your crop. And for another start there’s the fact that I don’t actually like them anyway. But then last year Hugh Fearnley-Whittingstall waxed lyrical about them in the Guardian and I decided to give them another chance in the hope that home-grown ones would actually be delicious and not have that horrible carrot taste. I know, what can I say, I’m suggestible like that. So far I’m none the wiser about the taste. Last year a few carrots germinated and then – surprise, surprise – the villainous carrot fly penetrated my half-hearted defences and all we got was a few really manky looking carrots that were barely worth adding to the stock pot. So naturally this year, instead of cutting my losses and realising I was right all along, I’m raising my carrot-growing game. Carrots really are a bugger – they germinate patchily, and then you can’t thin them in case you attract the carrot fly so you end up with packed clumps of weedy carrots interspersed with bare patches where nothing came up. 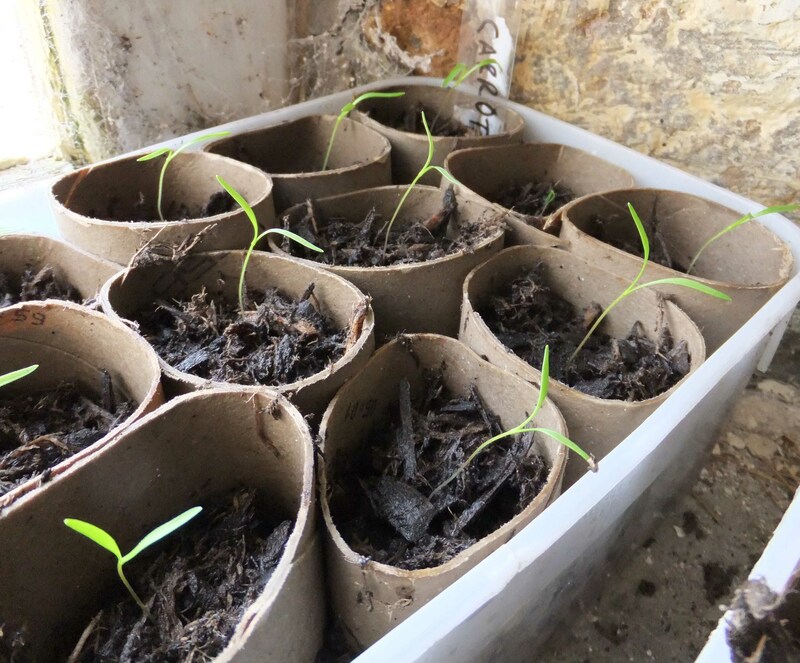 But this year I’ve ordered ‘resistafly’ – none of your mimsy heritage varieties will do when there’s a war on – and I chitted them to pre-germinate them so I was only planting out viable (and evenly spaced seed). Round one has not gone well. 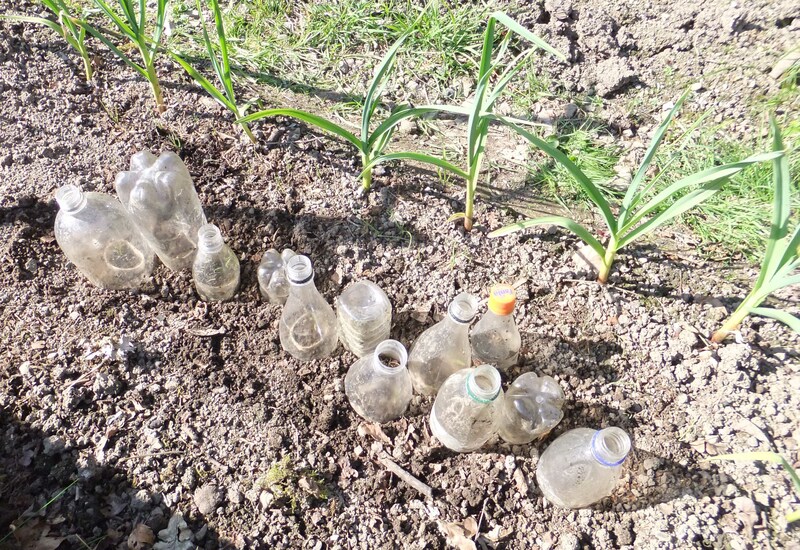 The chitted seeds were planted out in a meticulously prepared bed, surrounded by garlic and spring onions to throw the carrot fly off the scent. Precisely one came up – or rather only one came up and survived the slugs long enough to be counted. Nothing daunted, I have just planted out what must be the most pampered carrots in christendom: chitted gently over the heat of the rayburn, grown on in loo-roll modules and hardened off in the shed, planted out with great care and attention in their individual modules and finally protected from the slugs by bottle cloches. It’s an entirely over-elaborate way to grow something that costs about 20p in the shops and you don’t actually like. But it’s gone beyond economics and indeed horticulture. I’ve become determined not to let the carrots – and the carrot fly – win. I’ll grow carrots if it kills me. Which frankly, given the way they taste, is entirely likely. So apparently – I do wish people would tell me these things, how else am I supposed to know? 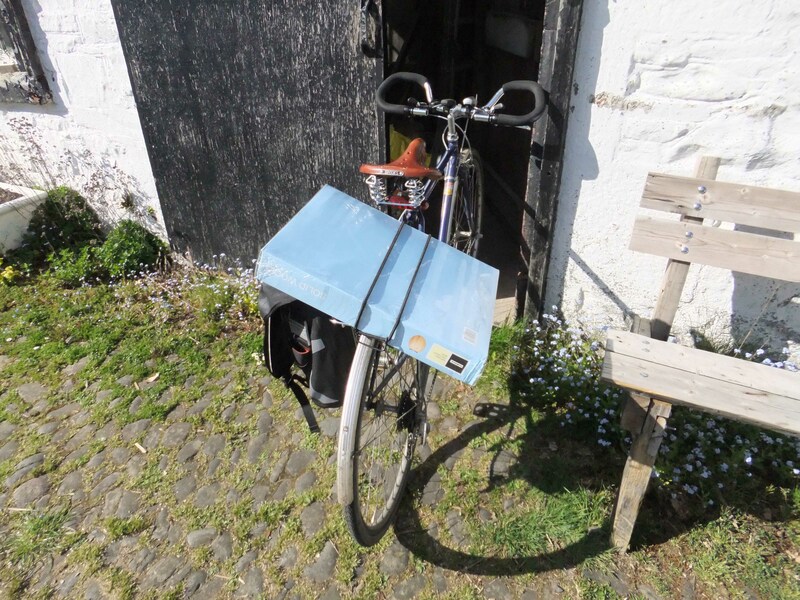 – it’s more or less compulsory for a bike blog to include a post on some ridiculous amount of stuff the owner has managed to carry on their bike instead of using a car. Up to now I’ve been remiss, mainly because my cargo has been limited to library books, newspapers, the odd pint of milk and emergency bacon purchases. I’m working freelance at the moment and been working to a deadline so I can only really justify actual useful bike trips rather than joy rides so I haven’t been able to take full advantage of the good weather. * But today I had a whole set of errands to run in Bigtown: going to the library, picking up train tickets, finding out some information from the local volunteer centre and buying a replacement loo seat. Apart from the latter it was a perfect excuse for getting on the bike and as it was far too gorgeous to contemplate taking the car I decided to risk it. After all, people in Holland are always moving sofas or entire kindergarden classes or what have you by bike, how hard can it be? Well, perhaps surprisingly, not that hard atall. It would have been easier if it hadn’t still been in its box, but I decided that, while the phrase ‘adjusts to fit most standard toilets’ sounded wonderfully reassuring in the shop, on closer examination it contains more weasel words than a Mustelid research institute’s library and if there was a problem, I doubted they’d take it back without the packaging. And I decided against going round the main roundabout because, much as I love jousting with traffic in the middle of the school run, I could just see the box slipping loose as a giant 4×4 bore down upon it. The main problem, if you really want to know, is that I had foolishly chosen to wear my jeans, which are still rather snug, and so it was hard to get my leg over, as it were. And my bungees have lost some of their bung, so my cargo did break free when I hit one completely egregious pothole, but fortunately only once I was out in the country with plenty of time to retrieve the box before the only car I saw on that road ran it over..
* Deadline is end of April, if you need to know when it’s going to start raining again. It’s all very well the seed packets telling you to ‘plant out when all danger of frost is past’ without anything to tell you – apart from hindsight – when that might be. It means I’m having to plant things on a strict one-in, one-out basis at the moment. 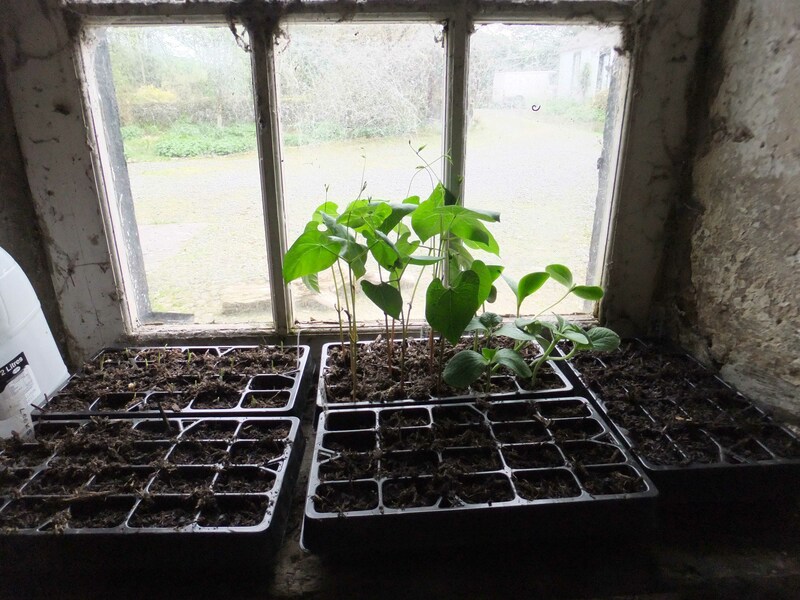 The kitchen window sill is crammed with tomato plants, dwarf french beans, lavender, basil and some campanula I’m hoping to raise from seed. The shed has sweetcorn, more beetroot, leeks and spring onions plus squash, pumpkin and climbing beans which are threatening to climb out of their pots of their own accord. The cold frame has the salad seedlings and the perpetual spinach and a few modules of left over broccoli, savoy cabbage and romanesco. 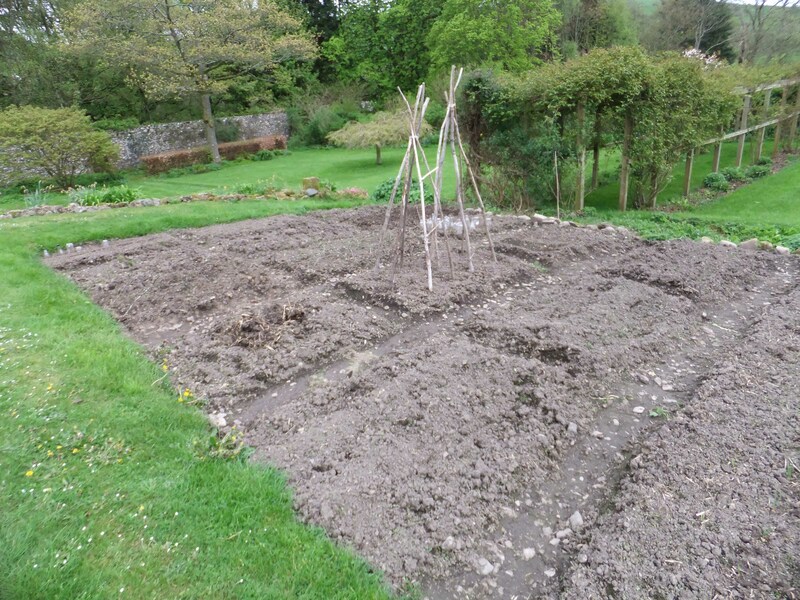 Everything I dare plant out is planted out, the beanpoles are ready and the soil has been prepared and I was working in a t-shirt this afternoon, weeding and digging and earthing up my potatoes. But there’s an east wind blowing and frost has been forecast and there’s no point risking everything I’ve planted at this stage in the game. So it’s probably completely the wrong time to be posting this – the now traditional (well, I did it last year – much later in the season I note) annual celebration of the turning out of the cows after the confines of the winter. But you know what? I couldn’t resist. Enjoy, and do a little happy cow hop at the end of winter (provisional, pending full analysis when May Be Out). And please do refrain if you can from telling me in the comments how HOT it is elsewhere and how you could do with some RAIN. 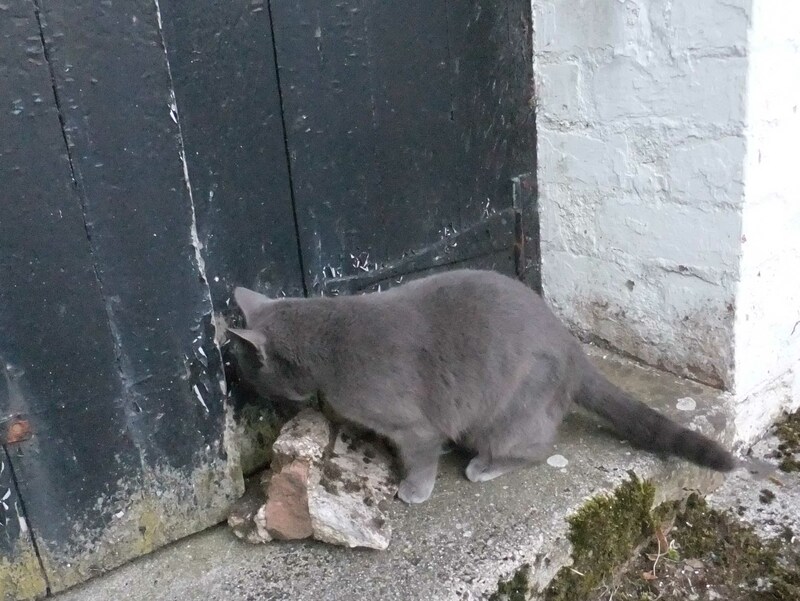 … with news that the rabbit (or possibly a different rabbit) is rumoured to be back in the walled garden. So far it’s only been spotted once, and a thorough check through the vegetation has failed to find either a breach in the defences or any actual rabbit but that doesn’t mean it isn’t in there. 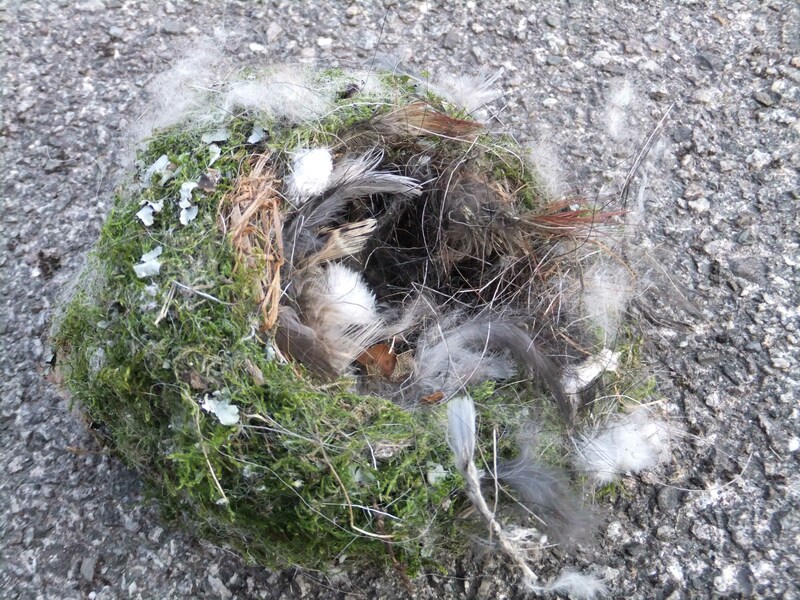 We found this lovely little nest lying in the road yesterday – no sign of any carnage, but that doesn’t mean anything. But then, we’ve reached the time of year when if you worry too much about all the baby birds there are around, you will go mad. However, we do feel we have a particular duty of care to the swallows. One of the remoter outposts of the other half’s shed empire has been given over to their nesting activities. For the last couple of years, apart from the small matter of the poo, all has gone well. But this year, the neighbour’s cat has grown from cute kitten to fully fledged killer and it appears to have taken up birdwatching as a hobby. 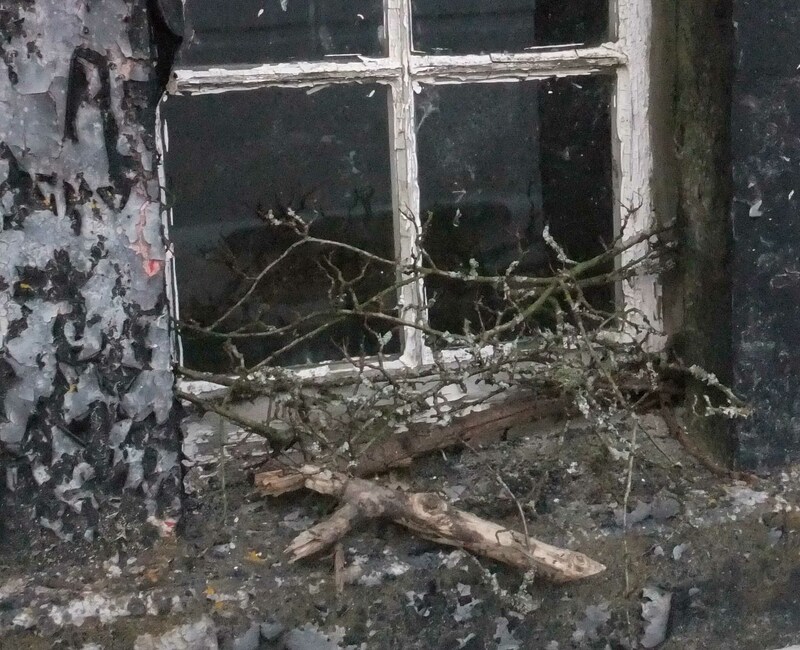 * The swallows swooping around the courtyard drive it into a tail-twitching frenzy and it’s quickly learned that they have to fly in and out of the shed via the top window, so that is where it sits, waiting for an opportunity to pounce. The swallows had noticed too and after we’d seen them making a sudden u-turn at the approach to the window, I decided it was time to act. You can’t train a cat, and the jet of the hose doesn’t quite reach that window anyway, so more direct measures were called for. 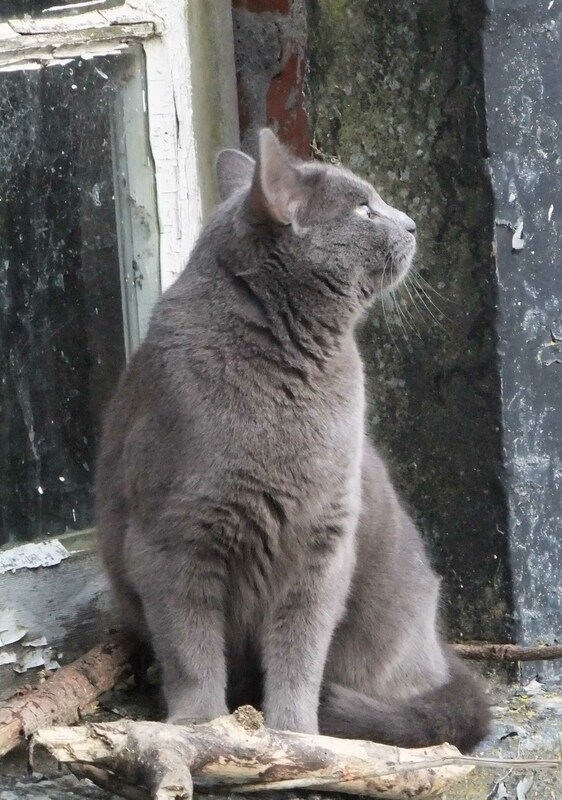 It’s kept the cat away from the window, although – as the swallows have also been known to slip through a gap in the door – she’s still hopeful. It might turn out to be a long and stressful summer. You are currently browsing the Town Mouse blog archives for April, 2011.